Theodore Roosevelt said, "The first requisite of a good citizen is that he [or she] shall be able and willing to pull his [or her] weight." Choosing Kendall Bearup for Citizenship was easy! 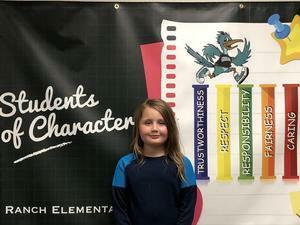 She always does 100% of her expected workload, keeps her desk orderly and clean, and goes out of her way to help keep our classroom in tiptop shape. She is honest in dealing with her fellow classmates and one we’ve all come to trust. She cares about everyone and never has a harsh word. Kendall is respectful to self and others. She is responsible, courageous, and hardworking and one who will succeed in everything she attempts. Congratulations Kendall, you deserve this Citizenship honor!